How clean is your holiday calendar? The months of November and December on my calendar have already become stained with black ink. We aren’t even to the middle of November yet and I have two events scheduled for the first week of December. We have a Women’s Fellowship on Monday and our community “Christmas in the Village” is Wednesday where I hope to man a booth to sell our anthology, Christmas Treasures. Our church’s big holiday dinner is the next week, I’m hoping to go to hear the Choral Dynamics Christmas Concert somewhere in there, and my daughters are coming home a few days before Christmas. I’m sure we’ll get invited out to a couple of New Year’s Eve parties and . . . .
Whew! Just think of what it would be like if I worked in an office and my girls were still home. Parties, concerts, holiday bazars – it’s a busy time. And every event is accompanied by food of some sort. No wonder the stores taut exercise equipment throughout January! Gotta take off those extra pounds from holiday fare! Holiday snacks are so much fun. I probably put on the weight because I love to eat all those yummy things I don’t get the rest of the year. Fudge, divinity, cutout cookies, yogurt covered pretzels , Mexican wedding cakes, Moravian Sugar Cake . . . oh yum! In her story, “The Forever Christmas Gift” that appears in Christmas Treasures: A Collection of Short Stories, Elaine Stock mentions yule logs, Towering Christmas Trees, and chocolate covered pretzels. My mouth is watering as I write. Sounds like perfect party fare to me! 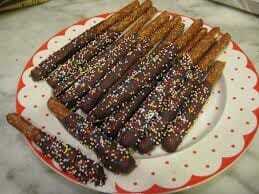 One of my favorite holiday snacks is a recipe a friend shared with me during our first ministry. It’s messy to eat at a party, but it’s so good. Here’s my recipe for Puppy Chow. Over low heat, melt chocolate chips, margarine and peanut butter. Pour cereal into large bowl, preferably with a sealable lid. Pour melted mixture over cereal to completely coat. Sprinkle powdered sugar on top and seal bowl. Shake until cereal is coated and powdered sugar is absorbed. For all the frenetic activity of the Christmas season, the holidays can be the loneliest part of the year for many folks. Perhaps all your friends have full calendars but no one has invited you to anything. You might be with others but the people you really want to spend time with can’t – or won’t – be with you. The holiday season might represent anniversaries of sad events – days of losing loved ones. And sometimes, for no apparent reasons, the shallow conversation of parties and social events leave you feeling hollow inside. Have you ever felt lonelier in a crowd than if you had stayed home alone? I have. I haven’t read it yet but Elaine’s description makes me want to hear how her characters find that hope and joy in the midst of loneliness. My heart aches for the man who sadly has grown accustomed to loneliness and I so want him to find the Christmas connection. I want to tell him about Jesus whose nickname was Emmanuel – God with us. That’s the beauty of Christmas – that God chose to come near, to remove the barrier that kept us from Him. He loved us so much, He was willing to give up anything – even His son – to restore our broken relationship with Him. Loneliness doesn’t have to be a forever thing. 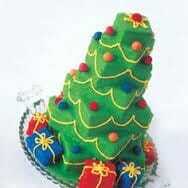 Besides, I want to know what these towering tree cakes are all about. Elaine Stock loves to write. Represented by Linda Glaz of the Hartline Literary Agency, Elaine is an award winner writer, including a semi-finalist in the ACFW Genesis Contest for her novel, Walk With Me. You can find more of Elaine’s writing at Everyone’s Story. Check out Elaine’s story and other heartwarming tales of Christmas here. Who would you like to spend the holidays with? What snack would you like to share with them? Pass the Puppy Chow, please. Is Thanksgiving A Dying Holiday? Karen, thanks so much for featuring my story, THE FOREVER CHRISTMAS GIFT. What a lovely blog presentation! I have to share this chuckle: when I first read that “Elaine Stock loves to write” I misread it as: Elaine Stock lives to write!! Some days, I think that’s true! I just received my book today and I’m looking forward to reading your story, THE CHRISTMAS GIFT. Elaine Stock recently posted..Angela Breidenbach: You Can Do It. Why Not? It was wonderful to be able to share your story! 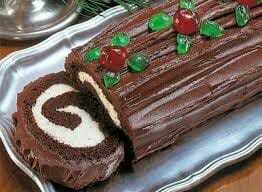 That chocolate yule log looks amazing!!! That Puppy Chow recipe sounds easy and delicious! I’ll have to try it. Kathy Rouser recently posted..And the winners are . . .
What a nice post, Karen. I had never heard of Puppy Chow. Sounds yummy.